Since 1976, more than 5,000 women in higher education have further developed their leadership ability at an elite summer institute. Following this year’s program, two St. Norbert women talk over the HERS experience. 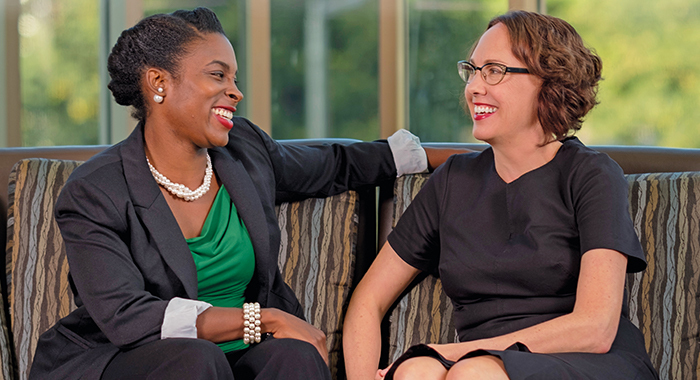 Last summer, Karlyn Crowley (English, CVC) and Tynisha Meidl (Education) joined 66 other women at Bryn Mawr College for the HERS Leadership Institute, a two-week immersion course that prepares women faculty members and administrators for leadership roles. Acceptance to the highly competitive program brought with it the chance to introduce St. Norbert College women to HERS – the Higher Education Resource Services program – and a year of preparation focusing on institutional awareness, networking and self-knowledge. Crowley: I feel like people are always going to ask, “Why should a women-only leadership program exist?” In higher education, you can look at the data and we know that, statistically, seeing women at the deans’ and presidents’ levels is still really low. And as people talked about at HERS, we’re about to have a mass exodus at the dean and president level of men, especially, who are retiring. So, the next generation of leadership of higher ed is being shaped right now. HERS reaffirms the degree to which it’s still so critical because so many women still don’t see themselves as leaders in a really deep way. HERS tries to reframe that. Meidl: It’s interesting because, unless you know what HERS is and you look at what each of the letters stand for, you would not assume – it would be misleading, right? It would be misleading in the sense that you would not assume that it has focused and has been structured for the past 40 years on developing the next generation, or the next cohort, of leaders in higher ed, particularly deans, directors, chairs, provosts and presidents. They’ve been doing this work for a long time. Crowley: It started in ’73, which is early, and at Bryn Mawr. So intentionally having it at a women’s college is really powerful, visually and experientially – to see the campus as a space, as a kind of incubator or lab for women’s leadership. And it’s considered the premier institute for women in higher ed. It’s all the parts. Crowley: It’s not just women’s leadership, it’s not just higher ed and co-ed; it’s women’s leadership in higher ed, specifically. HERS has this amazing number of alumnae who have now gone on to be deans and presidents. There’s something really specific about that women’s-only environment and space – to be self-reflexive about gender and other forms of identity and leadership – that’s different from other kinds of leadership programs, many of which may be a week or less. And we both have little people in our lives. You can imagine what it has meant historically for women to – for two weeks – live in a dorm and think about their leadership. Meidl: And I would say, if we think about HERS not just as this two-week residential experience, but about what actually happens in the two weeks, there are three major components: career development, individual leadership and institutional awareness. In terms of career development, HERS challenges participants to think about where they are now, what they value, what is next – and what is after that, and what is after that, and potentially after that. It’s about having structures in place that facilitate that thought process. Coming out of HERS, I recognized that that was really one of the first times that I thought about, not just about where I wanted to be, but what are all the other pieces that inform where I want to be, professionally, and what are the implications of those decisions? Meidl: So what’s the next piece? Meidl: Yes, your own individual leadership profile. Who are you as a leader? How does your personality inform your decision-making process? How does that inform how you go about your work? How does that inform your relationships, how you build them, or maybe how you don’t build them? In other words, coalition building, or this notion of team, and what that means in terms of helping to fill gaps in a leadership style or to complement your leadership. And after spending two weeks discussing leadership and focusing on my own leadership profile, I have much more confidence in my own leadership. Crowley: I agree. I have a renewed sense around my own intuition as a leader and also what in gender studies we call agency – the movement between a thought and the ability to act on and complete or fulfill the thought. A high sense of agency means you have a lot of confidence to be able to follow through, and I left HERS with a greater sense of agency. That’s what I long for, think or hope for, for myself and the college. I have a much greater sense of confidence that it can be done. But HERS isn’t all about the individual. While some people might perceive attending a leadership program as a self-centered move – that it’s all about the self, we’re improving one’s own leadership – the focus of the institute is as much, if not more, on bringing back what you know to your institution and thinking with the system’s mindset about your institution. Meidl: Exactly. Another main component of HERS was on institutional awareness: really understanding the landscape of higher education, everything from student affairs to the business and finance and auxiliary side, to legal counsel, to legal affairs, to the academic piece, and diversity and inclusion and equity. So really providing a big, broad brush stroke of the key facets of what make institutions of higher ed work. Crowley: And I think something that’s particular to HERS that’s a little different from other leadership programs is that we had a lot of pre-homework to think about a leadership project that we would do at HERS and then bring back to our own campuses. Meidl: That was part of our application. Crowley: Exactly, that was part of the application. It’s a competitive application, and not all leadership programs are. So even before we started, we were thinking about a leadership project, and now we’re continuing those projects here. HERS also allows us to bring St. Norbert into this incredible network of women leaders. We send leaders to HERS, who then get to hone and focus and work on their leadership profiles, and then they also get this incredible networking cohort for the rest of their lives. That’s why some schools send and have sent women leaders year after year, because they’re not only interested in helping their own people develop leadership skills wherever they go, whether it’s the institution or somewhere else, but they want to have access to a really exciting pool of women leaders who are interested in their own improvement. St. Norbert really benefits by basically this beautiful cycle of having people go and bring back information to the institution. Meidl: And we really hope we can continue the cycle. It’s so important more women from St. Norbert get involved. I have an analogy. Think of a road: There are lots of layers in a road. Before a road can be made, there’s a bunch of trees in the way. We just knocked down those trees. Now we need more women to go, to be that foundation, to be the gravel, to be the asphalt, and eventually to be the lines on the road. All the while, we’re building that road to increased women’s leadership at St. Norbert.